This plastic fork tooling is HSK 25E tool holder clips, it is used forHSK25E tool holders holding. The HSK25E tool fork is fit for all HSK 25E toolholders. Widely used with automatic tool changer cnc machines, such as cnc engraving, cnc milling machine, VMC (Vertical Machining Center), etc. 1. Made in Taiwan, famous brand. 2. Imported POM plastic material, high quality, reinforced and anti-explosion. 1. Apply for auto tool changer cnc machine tool magazine, drum-type, carousel-type, etc. 2. Application industry: CNC hole drilling, CNC milling, CNC engraving, high precision and widely used for high precision processing. HSK 25E CNC forks are available in stock for quick delivery. 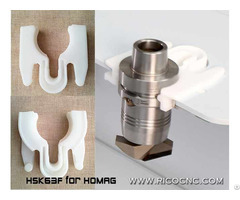 Rico CNC supplies high-quality CNC machine toolings, consumables, replacement and accessories. 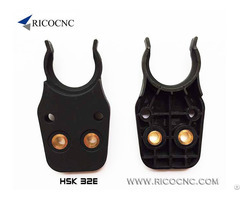 ISO tool clips (ISO30-ISO25-ISO20-ISO15- ISO10), HSK tool forks (HSK63F-HSK40E-HSK32E-HSK 25E), BT tool grippers (BT50-BT40-BT30), CNC replacing tool changer forks for many auto tool changers CNC machines. Payment can be made by Western Union, Paypal, T/T. 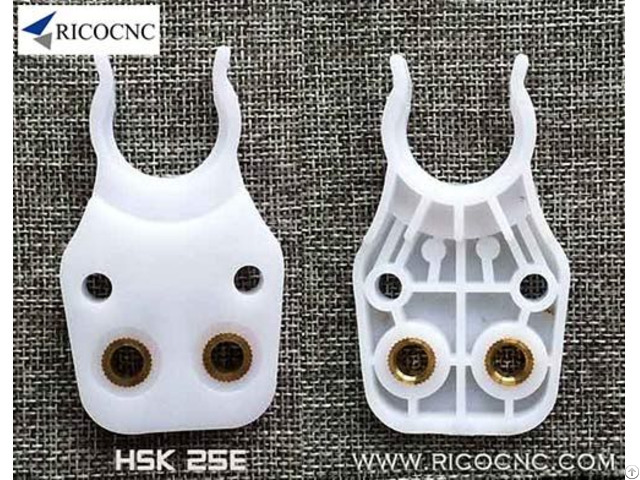 Business Description: Rico CNC supplies cnc router, woodworking cnc machines, stone cnc routers, atc cnc routers, laser marking machine, fiber laser marking machine, carbide lathe knife, wood turning tools, form mill bits, foam cutters, foam cutting tools, ISO30 ISO25 ISO20 ISO15 ISO10 toolholder forks, HSK63f HSK50E HSK40E HSK32E HSK25E tool grippers, BT30 tool clips, BT40 BT50 tool fingers, SK40 tool fingers, ISO BT toolholders, automatic pressure foot, edm machines, moly wire, molybdenum wire, edm wire cut, brass wire, edm consumables, etc.